Cooking at the campsite is one of our favorite summer activities. It’s hard to know what you’ll need to bring until you arrive and you’re missing something. Learn from our mistakes and follow our Campsite Kitchen Checklist to help you pack all the essential and luxury items necessary to win at cooking at the campsite. Nothing is worse than showing up at camp just to realize you’re outta gas. Always check your fuel before you go and pack more than you think you’ll need. One thing to consider when packing for your trip is that you consume more fuel at a faster rate when cooking at a higher altitude and in colder conditions. Propane performs better than butane in high altitude, and cold conditions, we are proud to offer both options. Leave the fine china and paper plates at home. Invest in a quality reusable cookware set. A simple set of compact and durable pots, bowls, and plates is all you need to serve up a delicious meal without risking injury to your home collection or potential litter to your favorite campsites. Even if your stove has a built in igniter, it is always smart to pack some matches or a lighter just in case of equipment failure. Keep your food warm and protected from bugs as your adventurers are heading back to camp from their latest exploration. Keep your tools and your hands clean before and after cooking. The best way to ensure the longevity of your gear is to keep it clean. It can’t hurt to bring a few trash bags to your next cookout. Toss excess food and non-reusable accessories and pack it out to keep your campsite clean. What Are Your Campsite Essentials? 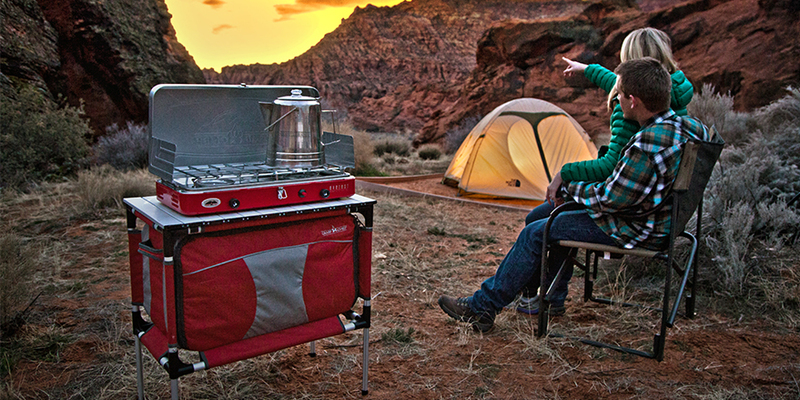 Let us know what you bring on your camp/cooking excursions below. If you have any awesome suggestions, we will be sure to add them to our list! Vegetable oil, paper towels, and Dutch oven liners. Don’t leave home without them! I like it! Thanks for the feedback. I lost a net screw to hold a leg on. Can you help me? Sure, Jim. Please call our customer service team: 1-800-650-2433 or email: [email protected]. They will take great care of you. Camp site trash bags containing food scraps will attract scavengers that can tear up a camp when the camper is away fishing or during the late night hours when the campers are sleeping. I place all food scraps in a heavy plastic bag and then saturate to contents of the plastic bag with ample amounts of caustic smelling Clorox or some other foul smelling bleach liquid to disguise the odor of the discarded food scraps. Later the treated plastic trash bags are properly disposed of. The key is to conceal the odor of the discarded food scraps with a caustic liquid. Awesome advice! I had a little scavenger eat through my backpack last summer while backpacking in the Sawtooth Mountains. Great way to avoid a messy cleanup. Thanks for the feedback! I have everything I need to go camping in 3 plastic boxes. If someone says lets go camping, I throw those 3 boxes, an air mattress, my sleeping bag, bedding, coolers and Camp Chef stove and needed pots and such and off I go. I need not grab silverware, it is in the boxes, cooking pots, in the boxes, bug spray, in the boxes, first aid kit, in the boxes, anything you might need beside bedding and tents and such, is in those boxes.